I am so excited to be sharing my blog space today for the very first time ever by featuring a special guest post from a blogger whose work I really enjoy reading. Visiting Natalie's blog is like browsing an enjoyable magazine; it's light and fresh and very approachable in style. Please do support her space by paying a visit to her website here and following her blogging journey on social media. You can find her on Bloglovin', Twitter, Pinterest and Instagram too. And now it's over to Natalie! Hi, I'm Natalie from Sophisticated Mumma blog. I'm a Beauty Therapist (who happens to be a Mum of four) and I love to post all things Beauty, Fashion and Food. Jody has been a sweetheart and has requested me to share a festive recipe with all you lovely readers! Now, part of my family is Scandinavian, so it makes perfect sense to incorporate a little Nordic influence into our festivities. 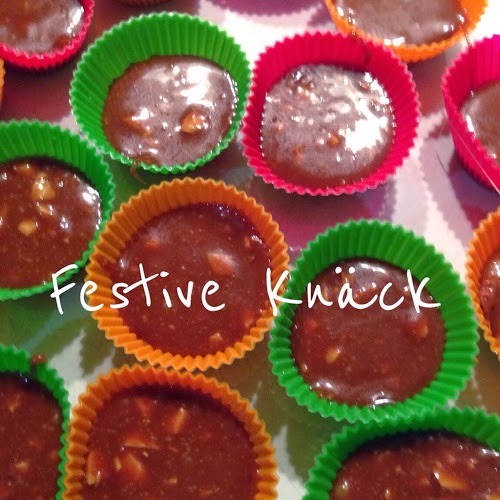 A really lovely sweet treat is 'Knack' which is basically Swedish for 'crack.' It's a kind of toffee, totally naughty but very, very nice. Traditionally the Knack is made by boiling the ingredients up until it gets to a certain temperature and then it all gets a bit too scientific with boiling temperatures and such like. As I prefer to whip these up a little quicker, I use the good old microwave. 2 tablespoons of finely chopped almonds. Use a microwave proof container, (ideally a large jug) and mix the cream, Golden Syrup and sugar together. Pop it in the microwave on a high setting for approximately 7 mins. Take the container from the microwave carefully as the contents will scald if handled without care. 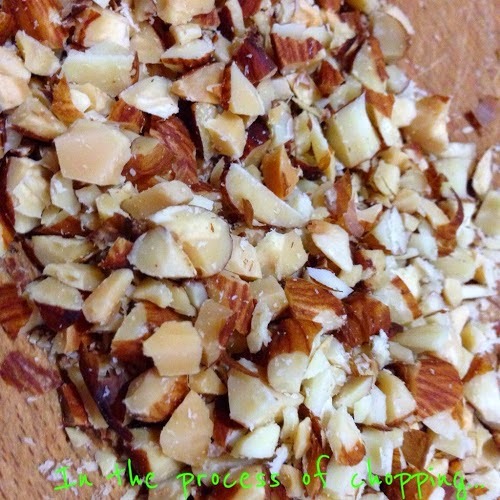 Quickly pop the chopped almonds in the same container and stir them through. Immediately pour into your mini cake cases as the mixture will quickly harden. Place in the fridge to cool / set and then place in an airtight container. Ideal for adults, older children and fans of the Daim lollies sold in Ikea. Natalie, When and why did you start blogging? I started blogging in March of this year, so I'm a newbie and the blog is still evolving. I actually started the blog as I was so inspired by my Instagram contacts and their own blogs. I felt, I too had something to offer the blogging community especially as I have informed beauty knowledge. I believe anyone can inject a bit of glamour and pampering into their everyday without spending a fortune. What are your three favourite posts you've published and why? Keeping up with the festive season, a recent post, was about prepping skin for the holiday season. It's a quick, yet effective way to incorporate a quick pamper session into your shower routine. Another recent post offers Summer alternatives to a pair of shorts. I mean, shorts are great and all that, but, (and it's a big BUT! ), I prefer something that covers my legs a bit more. This post is for the ladies out there who, like me, prefer an alternative. Finally, a post I compiled a while back. It's actually a rather important one on finding a good Beauty Salon. I constantly hear lots of horror stories with botched treatments or infections passed to clients and it really annoys me. The industry needs more regulation, however decent Therapists do uphold an industry standard, so here's a few pointers on what to look for in a Salon. How will you be celebrating Christmas Day? Christmas Day we will be having the extended family over to our house for a good old Aussie BBQ. Seafood, steak, the festive trimmings and just, hopefully, a relaxing day. Thanks so much for sharing your blog here Natalie! It's been great to get to know you some more and I can't wait to try your special recipe! Have you heard of Knack before? How will you be spending Christmas Day? Christmas on the blog continues! Have you missed any of these great posts and giveaways? #SLHFeaturedThursdays: I am Two! A Special Birthday Celebration Thanks to Ferguson Plarre Bakehouses and a Chance to Win a $250 Cake! Linking up for Open Slather and Mummy Mondays. Knack sounds similar to the toffees I used to buy on school cake days! I'd always get it stuck in my teeth but so worth it! "Knack" is new to me... I will be trying this recipe very soon. I know Miss 7 and Master 4 will be happy to help me...Yummo! Nice to meet you too Alicia! Swedish crack... Love the sound of that haha sounds delish!